The cockatiel is a bright and bubbly bird known for its playful nature and unique appearance. These birds are native to Australia and are related to the cockatoo, as you can see from the feathered crest on top of their heads. Though these birds are not necessarily high-maintenance pets, they do have specific requirements when it comes to their cages. Meeting your cockatiel’s cage requirements is the key to keeping him happy and healthy. 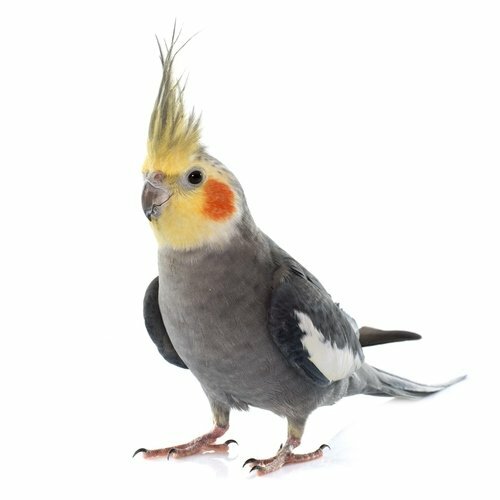 Keep reading to learn more about cockatiel care requirements and how to shop for the best bird cage for cockatiels. How Much Space Do Cockatiels Need? What Else Should You Include in Your Cockatiel Cage? Cockatiels are highly social birds that live in very large flocks in the wild. If you don’t plan to keep more than one cockatiel, you’ll need to spend plenty of time interacting with your bird. Keep in mind that you’ll have to handle your bird regularly to keep him tame and make sure he gets plenty of time outside the cage to prevent him from becoming moody or aggressive. It’s also important to provide your cockatiel with toys in the cage to provide enrichment. In addition to choosing the right cage for your cockatiel, you also need to keep it clean. Many bird owners prefer cages that have a slide-out tray on the bottom to make cleaning easy, but you still need to wash the cage regularly to kill bacteria. It is especially important to wash your bird’s food and water dishes on a daily basis. Cockatiels are very playful birds and they are quite active as well – this means they need a cage that provides plenty of space as well as different surfaces to hop between. Exercise is just as important for birds as it is for other pets, so you’ll need to provide a cage that enables your cockatiel to get his exercise. This is particularly important if he doesn’t get much out-of-cage time. Minimum Cage Size – The minimum recommended cage size for a cockatiel is 24x18x24 inches. Width and Height – In addition to providing enough square footage for your cockatiel, you need to pay attention to cage dimensions because these birds have a long tail and a head crest – the cage should be at least 24 inches tall, but bigger is better. Bar Spacing – Cockatiels are large enough that you shouldn’t have to worry about the bird getting its head stuck between the bars but spacing no more than ¾ inch apart is ideal. You should also make sure the bars are horizontal on at least two sides so your bird can climb. Perches – In addition to providing ample space for your cockatiel, you need to provide at least two or three perches of different size and texture (at least 3 inches in diameter). The best materials for perches are natural wood, wooden dowels, and bonded concrete. Keep reading to see our top 5 recommendations for the best bird cages for cockatiels. When it comes to choosing a bird cage for cockatiels, you have to provide ample space as well as plenty of opportunities for enrichment. You’ll need to think about factors such as size, dimensions, and materials when shopping for a cockatiel cage. Constructed from durable wrought iron, this bird cage will last for years to come. It may be more expensive than other bird cages on the market, but it is worth every penny. 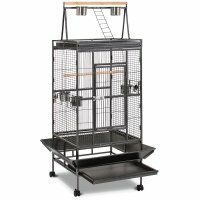 This bird cage features a seed guard that funnels waste into the slide-out metal tray and the whole thing is set on wheels for easy maneuverability. Plus, it comes in several sizes if you want to give your cockatiel extra space or if you plan to keep a pair of cockatiels together. Perfectly sized for medium parrots like the cockatiel, this wrought iron bird cage is full of unique features. It has an angled seed guard around the bottom that catches dropped seed and funnels it into the slide-out tray for easy cleaning. The cage itself is made from durable wrought iron and it is set on wheels to make it easy to maneuver. Plus, it has an extra ladder and perch on top for added space. 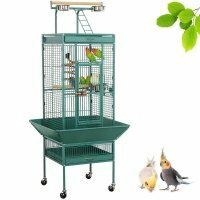 If you want a bird cage that provides your cockatiel with more than enough space, or if you’re trying to accommodate more than one cockatiel, this Super Deal 68” Large Play Top Bird Cage might be a good choice. Made from powder-coated iron, this cage is durable to withstand chewing and scratching. It features a slide-out metal tray for easy cleaning and comes with several perches and metal dishes. It also comes with a ladder leading up to an additional perch on top. 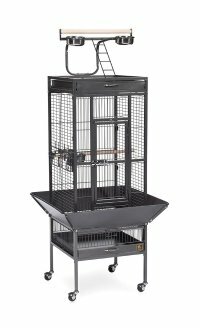 If you’re looking for a big, durable bird cage for your cockatiel this Best Choice Products Durable Bird Cage is a great option. It is made from heavy-duty materials that are built to last and features a unique design to reduce mess. This cage has an angled seed guard at the bottom that feeds into a slide-out metal tray for quick and easy cleaning. Plus, it comes on wheels for easy maneuverability. 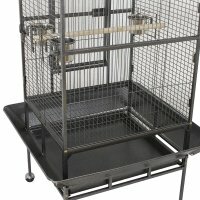 Whether you’re looking for a portable bird cage for your cockatiels or a basic cage to be separate from a flight cage, this Yaheetech 36” Portable Hanging Medium Size Bird Cage is a good option. Priced under $50, this cage is highly affordable, but it is still made from durable materials for safety. It features a slide-out tray for easy cleaning and a handle on top for convenient carry. It can also be used as a hanging bird cage or placed on a stand for your convenience. Cockatiels need a great deal of space because they are very active and because they are larger than some pet birds. The minimum cage size recommendation is 24x18x24 inches, but bigger is always better. You also need to be mindful of where you place your perches, so your cockatiel doesn’t have to hunch down. Provide enough space that your bird can sit up fully when perched. In addition to proving ample space in your cockatiel cage, you also need to include perches, toys, and food/water dishes. Cockatiels need at least two or three perches of different size, length, and material as well as at least one food and water dish per bird. Toys can include bells, mirrors, sticks, small objects the bird can toss around. 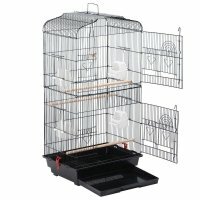 When it comes to cockatiel cages, bigger is always better so purchase the largest cage you can comfortably afford. Make sure the dimensions meet your cockatiel’s minimum requirements and take into consideration additional factors such as bar spacing and orientation. If you’re not sure where to start shopping for a cockatiel cage, try one of our top 5 picks reviewed above!